Simulation of a light rays being focused by an emmetropic (normal) human eye during accommodation. Shows light rays diverging followed by the lens becoming more convex. Eyes may have refractive errors such as myopia and hypermetropia. With age, the lens degenerates and becomes increasingly opaque, a condition known as a cataract. The animation begins with a vertical section of a normal human adult eye focused on infinity (or a distant object) with the light rays parallel. The eye is relaxed and the lens is pulled flat by the ciliary body (not shown) that is attached radially around the lens. During the first second, the light rays become divergent as their source gets closer to the eye. 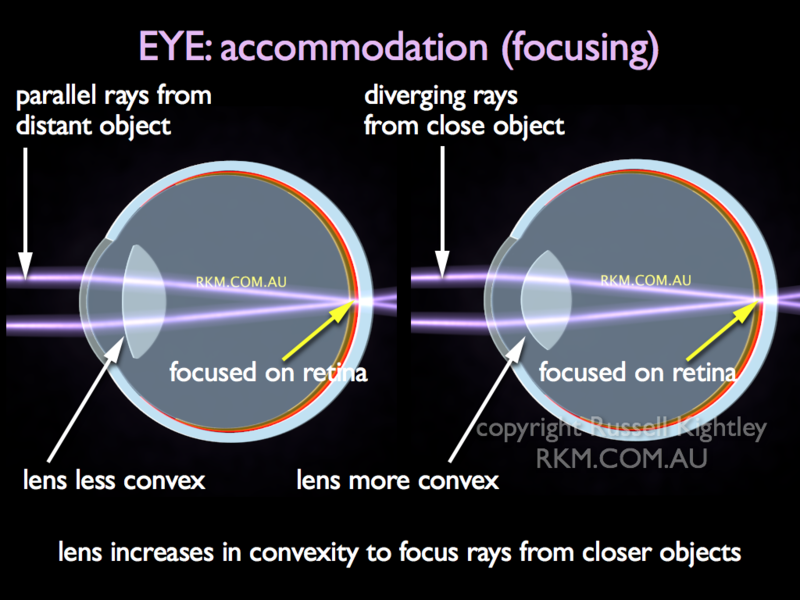 The lens is shown unchanged and you can see how the rays now focus behind the eye. Over the remaining two seconds, the lens becomes increasingly convex until it can refract the rays enough to bring them back into focus on the retina. In life all this happens in a fraction of a second. Most of the convergence is done by the convex cornea, whose refractive index is fractionally greater than that of water. However, the cornea is in contact with the air and so most of its refractive power is usable. The fine focusing is done by the lens. The refractive index of the lens is greater still but it lies between the aqueous humour at the front and the vitreous humour behind. Both of these humours have refractive indices like water and so they reduce the converging power of the lens. The lens is normally pulled flat by the ciliary body. When the ciliary muscles contract its muscular ring gets smaller allowing the lens to adopt its naturally more rounded shape.